Yukon Medical has extensive experience designing and commercializing medical devices. Our company size and team structure allow us to be agile and innovative problem solvers with a track record of providing outside-the-box solutions. Let us put this knowledge to work by optimizing our products to meet your needs. For many applications, our existing technologies can be an off-the-shelf solution for your drug delivery needs. They can be standalone or packaged with a drug. One of the most requested custom devices is a modification of our vial adapters to accommodate customer specifications. Whether you need a tooling change to the body, integration of a fluid filter, a bonded component such as a valve, or simply a change in the product color, our team can turn your concept into a state-of-the-art product to meet your needs. Our approach to customization consistently beats industry standard timelines, ensuring your concept becomes a market-ready solution when you need it most. Yukon’s ability to respond quickly to changing needs, our robust supply chain with world class quality systems, and deep knowledge of global medical device regulatory requirements means your product will be delivered in a timely manner at a reasonable cost. Yukon Medical’s customization options provide unique solutions for many compounding issues or problems. 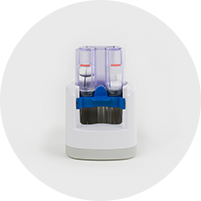 Two of our key reconstitution products are the Dual Vial Access Device and the SmartMix. The Dual Vial Access Device can be used to aseptically transfer a specific dose of fluid from one vial to another. Draw up a specific volume of diluent and simply press a switch to transfer the diluent into the other medication vial. The desired volume of reconstituted medication can then be drawn back into the syringe based on the patient’s weight or required dose. A .2 micron filter syringe pulls clean air into the vial helping it remain at atmospheric pressure. Connection options include standard female luer or female needle-free valve. The SmartMix can be used to reconstitute a lyophilized or liquid drug and diluent. Utilizing pre-filled fluid vials, the SmartMix offers an innovative alternative to pre-filled syringes and other specialty containers that require costly studies and significant development time. With one simple push to actuate the device, the drug and diluent are systematically mixed. Standard syringes with a luer connection can then be used to withdraw a specific solution volume. The SmartMix maintains a sterile system and locks to prevent re-use. 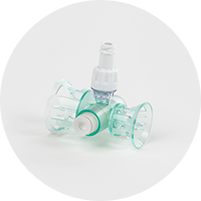 The Upright Eye Dropper Dispenser has the ability to assist patients with eye drop placement, improving the experience with drop instillation and increasing compliance. An upright bottle removes the necessity of a patient reclining the head to administer drops. The device measures proper dosage, with one pre-measured dose being released per “click” and reduces the chance of tip contamination when compared with a conventional eye dropper bottle. 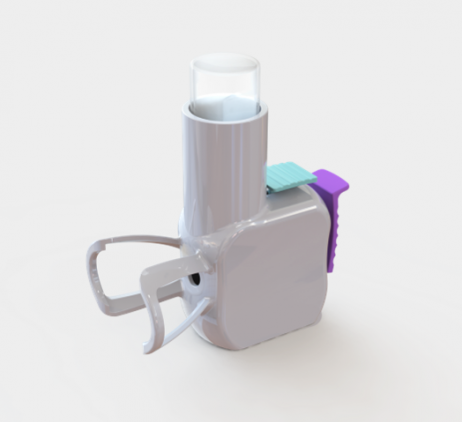 A bottle container is placed upside down into the device and a mechanism pierces the bottle, pulling medication into a small chamber. A closed system with hydrophobic filtration prevents any bacteria from entering. Pulling the trigger releases pressure, squirting out a stream of medication into the eye.